There has been a frying fiesta going on in my house. Chanukah celebrates the miracle of just a tiny bit of oil lasting for eight whole nights. It is only appropriate to give oil a central role in this holiday. Therefore, the two cardinal foods of Chanukah are latkes (potato pancakes) and sufganiyot (doughnuts). Don’t get me wrong, there’s absolutely nothing wrong with the classics – plain old potato pancakes or jelly doughnuts. However, I like to have a variety of flavors and each year, I try a new take on the prototypes. Already, I have given you a falatke recipe that mashes up falafel and latkes. 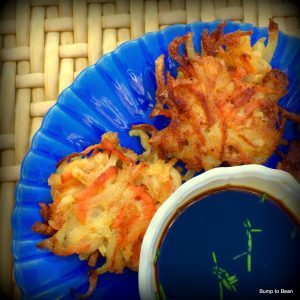 Today, I will show you another new fangled take on the latke. My four year old has been begging, pleading, beseeching me to make her carrot ginger dressing. She loves to eat salad and discovered the dressing at a friend’s house. It has been a full two weeks of yearning, and she has yet to get her wish, poor child. Don’t ask me why. It makes no logical sense. However, each time we set out to make this simple dressing, something happens and we don’t follow through. On Sunday morning, we bought all the ingredients for the salad AND the dressing. Then, someone wasn’t feeling well (eh, ok…it was me) and we never got to the kitchen. Grate the potatoes, onions and carrots. Honestly, I find the food processor to be the best and fastest way to go. Cut the potatoes into 2 inch chunks so you don’t get long strands. Now comes the important part (much more than whether you grate by hand or processor).